Our professional portrait painters turn your photos into beautiful paintings. A portrait from photo keep your smile on paintings for ever. Custom portrait paintings from pictures are perfect gift. Affordable Prices: Custom oil paintings from $70 . Only 20% deposit to start painting.The most important thing is that you can enjoy free shipping Now! Get Started! You can click Order Now button as well. Please find our best price list and know the price of your order. Choose the subject size and frames your want order. 2. Send your photos and attached your any special instructions. Pay the deposit 20% for your order. We will start to paint it soon. You will pay the balance only after reviewing your order and confirming it. 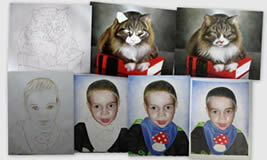 On portrait painting shop, our portrait painters will turn any photos into a 100% handmade work of art. Just send us a digital picture or scan your cherished photographs, our artists will create a beautiful portrait oil painting you will enjoy for a lifetime. We also offer beautiful frames and wrap gallery, so the painting can be ready for hanging. When you custom portrait paintings from famous Online Galleries or E-bay..., 80% photos to painting and oil paintings are painted by our oil painters in Xiamen China, So why not order directly from us to SAVE UP TO 40% COST? Our portrait painting shop is located in Xiamen China, the world largest oil paintings production base. We are always finding the best artists to paint your photos with the best quality and competitive price. Your painting from photo will be made by professional artists with decades of experience. Most of the portraits from photo on world-famous online art gallery (best quality but with highest price) are painted by our oil painters in Xiamen China. Maybe you do not believe, but it's totally true.We are always finding the best artists to paint your photos with the best quality. 80% portrait paintings and oil paintings are made in China, So why not order directly from us to SAVE UP TO 40% COST? If you can find another artist that can make paintings at the same quality but lower price, we will beat that price. All our portrait paintings are free shipping for all over the world, as you know the shipping cost form China is much cheaper than your nation. So we can do it. We offer beautiful painting with frames and wrap gallery for your choose, the painting can be ready for hanging when you receive it. Most of our paintings are made and framed locally and we can get the painting back to you in 7-10 business days as short as possible . We can design your painting by merging different photos together, adding or removing background and subjects to adjust to your preference. We do all of these for our customers for free. We are always finding the best artists to paint your photos with the best quality. You can require revisions when you not satisfied. we will be happy to modify the painting until you are 100% satisfied with the results. You will receive a photo of your painting approved by email before shipping, and pay the balance only when you are completely satisfied! 1. The valentine's day, what gifts we send can let's keep in her (his) heart forever? Of course, unique photos to painting. 2. His (her) birthday, what ways can express unique status in his (her ) mind? Of course, turn your photo into oil painting. 3. Friends' wedding ceremony, what gifts you send is both elegant and dignified? Of course, wedding portrait painting. 4. In a new decoraed house, what you hang on the wall can express the unique taste and set the family atmosphere to happiness? Of course, portrait painting from photo. 5. The parents' birthday, how can we record the happy recollections and the youth for them forever? Of course, family portrait painting. 6. The baby has been born, what ways can we choose to record his happy childhood? Of course, kids portrait painting. 7. The treasure pet, what ways can we keep it in our mind forever as a unique way? Of course, pet portrait painting. The artists work for us are well selected and most are more than 5 years painting experience, for the portrait painting they are even over 15 years experience. Our artists all experienced, talented individuals. They tend to specialize in a particular style, such as impressionism or portraiture. For example, one of the artists here does wonderful highly detailed landscape paintings but can't paint a personal portrait painting to save his life! The artist come primarily from Wushipu and Haicang Oil Painting Village in the city of Xiamen. Although termed a‘village’, Wushipu and Haicang is a modern collection of residences, shops and factories, covering more than 800 galleries and 6000 artists. Local Chinese Xiamen governments turning it into an icon for cultural construction and highlighting it for its unique industry.Portrait painting also defined painting from photo, picture to canvas,photos to painting,photos to painting,pictures to paint. A portrait painting to be easily remembered, a portrait from photo that keeps your smile on paintings for ever. Our top quality oil portrait paintings can be your best gift for your lovers as a pleasant surprise. Custom portrait painting direct from studio and save up to 40%, no middleman. We can offer you top quality portrait with more competitive price. Contact us for portrait paintings from photo such as family, babies, children, pets, weddings, your vehicle, work of art, famous people, engagement, anniversary, movie star,heirloom photos, museum painting with your face on the masterpiece and others you love. We offer the reproductions of various famous artists, such as Van Gogh, Monet,Wassily Kandinsky, Dali, Klimt, Renoir, Rembrandt, William Burgureous, Virmill, Alfons Mucha Thomas Kinkade etc. We can paint a beautiful painting for you just fully according to your photographs, Different size, styles can be custom-made. Our best artist will offer the excellent paintings for you. Let our professional portrait painters turn your photos into a high quality 100% hand painted custom commission paintings. Such as executive, corporate, academic or government portrait painting to hang in meeting room,your office,your bedroom,your living room or workplace.Our portraits painting include kid portrait,building portrait,family portrait,children portrait,baby portrait,pet portrait, Corporate and Executive Oil Portraits, Government portrait painting and so on. An hand painted oil portrait painting of you love or pet painted from photograph by artist is a stunning gift for birthday, Christmas, wedding, anniversary and special occasions. Imagine! Now you have a Magnificent true-to-life oil portrait painting of you or someone dear to you created just for you - at a fraction of price done by creative and well trained artist. It will become a family heirloom - handed down from generation to generation. We have painted the portrait for Europe's congressman,British imperial family, Movie stars. Museum quality is guaranteed for all of our paintings.